Friday was as usual intended for the people to arrive on site and settle down. Despite problems with changed flights all international guests were brought on site till the evening. Most throwers slept in the nearby hotel Passauer Hof, some set up their tent for free at the theme park (perhaps the better choice: "It's simply fabulous to have breakfast in front of your tent in the morning sun and then do some test throws, right beside a snorting bison herd browsing the grass."). After a short inspection of the competition targets, we ended the evening in the saloon, with a live band and rodeo videos. On Saturday the competitions started (later than scheduled) at 11 o'clock. The competition ground was again a pasture, something which had proven to be nearly perfect for our kind of event during the last years, due to the amount of space it provides and the barriers being naturally in place already. Attracted by advertisement in the theme park, quite some interested spectators came to look, all being very safety-aware and respecting the safety regulations. After doing some trial throws, some spectators where "hooked" and promised to train and come back next year. There were 5 targets reserved for the competition, into which each thrower would have 4 throws per event (totalling 20 throws/event, with an extra 5th training throw per target). Compared with the 7 targets we had in previous events, this setting was much easier to overlook for the main arbiter, reducing the waiting times during the competition. The points were taken down by 5 arbiters on the personal sheets of the throwers. As usual, these arbiters were participants who would in the next round switch places with the people just throwing. Many throwers liked that the release of the throws was given orally and not using a whistle. Before lunch, we completed the events knives 3m and 5m, after a meal in one of the food stalls in the theme park, the axe 4m and 7m events were held. The change of the distance markers on the ground, colored plastic barrier bands fixed with iron rods, was accomplished in nearly no time. But despite that, the sun was already near the horizon when the last 5 throwers had hurled their axes, and the distance events had to be postponed till the next day. Nearly all participants had dinner at the hotel, where we sat together till late in the night, discussing and making friends. The hotel musician contributed to the cultural education of the guests with a round of "schunkeln". Sunday started off with a members meeting of the European Throwing Club "Flying Blades" ( Eurothrowers). The meeting took 1½ hours and was held in three languages (E/F/D), some members who could not make it this weekend had transferred their votes to participating persons. After a review of the work done so far, the managing committee (Maier, Thiel, Catania) was reelected unanimously, then, among other things, the focus of future work (weapon laws in Europe) was decided. Afterwards, everybody proceeded quickly to Pullman City, where the distance event knives was held. Unfortunately there was no time for the axe one, as we staged a show for the visitors of the theme park half past noon in the riding hall: after a short introduction into the sport and a mock competition, the throwers demonstrated with much enthusiasm their skills at the big wooden target wall. A highlight was a knife that was thrown so that it stuck in the handle of the previous one ( picture)! In the following session, interested spectators were shown the basic throwing technique and could do some trial throws. This offer was taken up so enthusiastically that one of the targets broke down in the process. After a late lunch, many participants had to travel home already, so that not all could receive their winners certificates and prices (3 Professional Throwing Knife replicas produced and donated by Dieter Führer, 1 TFT thrower donated by me) in person later in the awarding ceremony. Many thanks to the management of Pullman City, who provided the location and the targets, and to the participants (esp. Michael and Claude) who assisted me as arbiters and in organisational matters! I think that everybody had much fun at this event, and chances are good that I can organise it again next year. Only knives with a rigid blade, longer than 23cm and narrower than 6cm (referee can allow other knives after a test throw of the participant). 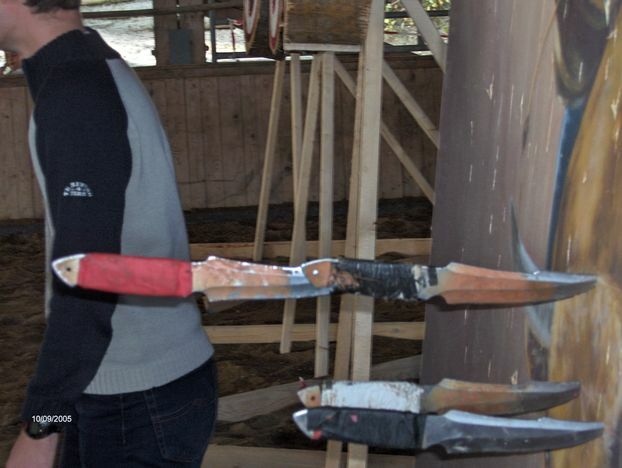 Axes with one and two blades with a weight between 500g and 1200g. Axes should be such (handle and head clearly distinguishable). With double-edged axes, only sticks with handle down count. Participants under 18 must be accompanied by a parent. If there are more than 5 of these young in an event, a separate scoring is possible. You may only throw after the commando of the referee! Events: knife short (3m), axe short (4m), knife middle (5m), axe middle (7m), distances given are minimum distances. Knife distance and axe distance. At the short and middle distance events, one has 20 throws (five targets, four throws at each). The tool will be scored after every single throw. One may leave it in the target. 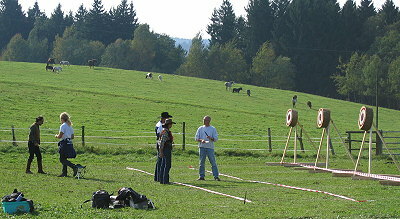 Before the four throws at each target, one may do a test throw, the participant has to declare in advance if he wishes to do so. Scoring: Bullseye black 6cm 5 points, first ring red 20cm 3 points, second ring white 40cm 2 points, third ring red 50cm 1 point. Knives will be straightened (90°angel to the target) before scoring, if two rings are touched, the higher counts. The counting point with axes is the middle of that part of the blade that sticks in the target. Here again: In dubio pro reo. Heights of the targets (from bullseye): 1,35m up to 1,75m. The referee is always right. If you do not observe the rules, especially those meant for security, you will be sent off the place.